We’re located in a nature reserve, with views of the Parc de la Serralada Litoral. Our location and our 100% sustainable operation make this the only place of its kind on the peninsula. We also serve top-quality organic Mediterranean cuisine, made with seasonal produce. Because at Mas Salagros we are committed to responsible, sustainable tourism and we’ve become much more than just a hotel. In fact, our EcoResort also features a fantastic thermal bath circuit managed by the international firm AIRE Ancient Baths Vallromanes. We want each guest to have the full experience and embrace the slow movement: taking the time to enjoy each moment. What is now Mas Salagros EcoResort was previously a farmhouse dating back to 1497 and known as Can Sala Gros. The location in Vallromanes, paired with the history of the building and the area, inspired us to create the first 100% eco-friendly destination on the peninsula with a thermal bath circuit, in collaboration with the international firm AIRE Ancient Baths. 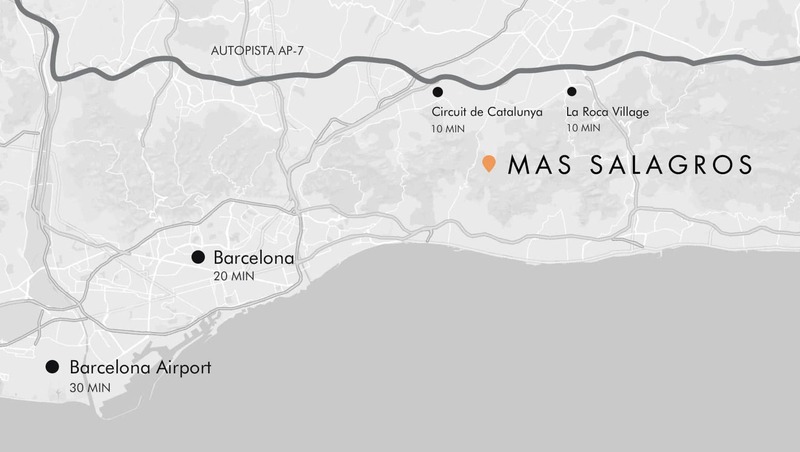 Vallromanes is just 20 minutes from Barcelona, making it the perfect place for a charming or romantic getaway or simply a relaxing weekend in a stunning natural setting: Parc de la Serralada Litoral. Our goal has always been to create a hotel that is so much more than just that. We strive to meet the very highest standards of sustainability and all European regulations regarding ecological issues and have created our dream spot, 100% eco-friendly. Our natural setting, along with the service and facilities at the complex, ensure guests will want for nothing during their stay. Plus, you’ll have the opportunity to enjoy our Mediterranean cuisine made with 100% organic produce, enjoying the bounty of the land, as part of what we serve comes from our own gardens.